Kenny Shiels believes a Derry win over Dundalk could see a title charge from the Candy Stripes. 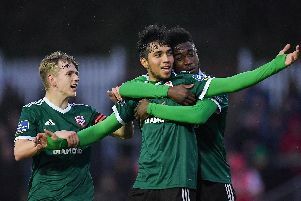 DERRY CITY manager Kenny Shiels has finally admitted his side are equipped for a title charge this season - provided they emerge unscathed from tonight’s defining top of the table clash against champions, Dundalk. Shiels, who has been reluctant to entertain the prospect of European qualification, never mind an assault on the league title, broke his silence on the title talk last night by declaring his side are “in the race”, should they take the scalp of the champions tonight. City sit in third spot, nine points behind Stephen Kenny’s troops and six behind second placed Cork City who will both be preoccupied with their respective European ties for the next two weeks at least. Kenny this week agreed that his former club were ‘right in the mix’ and was preparing his side for a ‘tough test’ at Brandywell. Shiels says his players must believe they are good enough to rip the title from the grasp of the Lilywhites and has urged the club’s supporters to get behind the team as they aim to close the gap at the top in, what he regards as, a win or bust match. “Come Friday night, we’ll either be out of the title race or be in it,” said Shiels. “Defeat puts us out of it and we’ll have to accept that. But, if we win, we’re right smack-bang in it and we’ve got momentum. “I don’t think we’ve conceded a goal since May in the league so we’re in good form going into the game. “If we believe in ourselves, that we are title contenders, then that’s how you achieve it in life. If you have that belief in what you do. When it was suggested Dundalk might be overlooking tonight’s match, just five days before their Champions League 2nd round qualifier against Icelandic outfit, FH Hafnarfjordur, Shiels insisted tonight’s match wouldn’t be a distraction. “I don’t think they will have one eye on the European game,” he added. “I think they’ll be coming here to play a title contender. The teams last met at Oriel Park in the 1-1 draw on April 1st when David McMillan gave the home side a fourth minute lead before Derry’s Conor McCormack was sent to the stands after 25 minutes. Derry showed tremendous fight to claw out a share of the spoils courtesy of Barry McNamee’s second half strike and Shiels is confident his side can, once again, prove to be a match for Kenny’s side. “We can match Dundalk and I would like to think we can match them better than we did down there,” said the Derry boss. “When we were down to 10 men, it made it very difficult for us. When you’re down to 10 men against the league leaders and the champions of the last two years away from home, you have to show some resilience and we did. Delighted with the performances of the IFA officials in last week’s 1-0 win at Wexford, Shiels says he hopes tonight’s match officials will allow the game to flow. “The referee is going to play a big part. If we have the referee we had the last time (at Oriel Park) then I would tell the supporters not to come. There’s no point in coming to watch teams being restricted and when there’s no flow in the game because players have been sent off or booked.